The Oakland Raiders, defending NFL Champions, were heavy favorites as they faced the New York Jets on October 23, 1977. Head Coach John Madden’s team was 4-1 and coming off a loss the previous week to the upstart Denver Broncos. QB Ken “The Snake” Stabler (pictured at right) gave up seven interceptions against the Broncos, but was still a highly capable passer while FB Mark van Eeghen led the ground attack, and the line was very much a strong point. The aggressive defense was showing some age in spots but remained a tough unit. New York, meanwhile, was 2-3 under new Head Coach Walt Michaels and in the process of rebuilding. Gone was star QB Joe Namath, and in his place was another quarterback out of Alabama, Richard Todd. 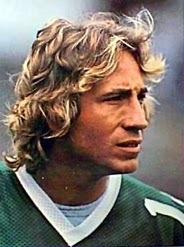 The team’s 1976 first draft choice was showing potential, but had tossed only three touchdown passes thus far. Another player displaying potential was swift rookie WR Wesley Walker, who could make big plays but also had many drops in the early going. There were 56,734 fans in attendance on a sunny afternoon at Shea Stadium. The Raiders took the opening kickoff and drove 72 yards in 12 plays. Mark van Eeghen ran the ball seven times for 48 yards, with a 19-yard carry setting up his three-yard touchdown run. Errol Mann kicked the extra point to give the visitors the early 7-0 lead. The Jets responded with a six-play, 73-yard possession. Richard Todd completed three passes to TE Jerome Barkum, the second for 39 yards to the Oakland 22 and the last for an 18-yard TD. Pat Leahy converted to tie the score. Oakland came back with a long scoring drive of 76 yards in 13 plays. Ken Stabler completed a pass to TE Dave Casper for 13 yards in a third-and-12 situation and connected with Casper again for a 19-yard touchdown. Mann’s kick gave the Raiders a 14-7 lead. The Jets then struck quickly in return. On the second play after the kickoff, and following a holding penalty that backed them up to their 13 yard line, Todd fired long down the right sideline for Wesley Walker (pictured at left), who beat CB Skip Thomas to make the catch and went the distance for an 87-yard TD. However, Leahy missed the extra point and Oakland was still ahead by 14-13 at the end of the eventful opening period. Following a quarter of unstoppable offense, the teams traded punts to start the second quarter. Midway through the period, the Jets again moved rapidly to put points on the board. On first down, Todd again went long for Walker and it was complete for a 52-yard gain to the Oakland 22. FB Clark Gaines picked up eight yards on a draw play and then Todd passed to WR Rich Caster coming across the middle for a 14-yard TD. This time Leahy made good on the PAT and New York held a 20-14 lead. On the next series, the Jets got the ball back when Stabler, pressured by DE Lawrence Pillers, threw a pass that was intercepted by LB John Ebersole. But two plays later, Todd was picked off by CB Neal Colzie. The visitors went three-and-out on the resulting possession and punted, and, taking over with 1:41 left in the first half, the Jets advanced 58 yards in eight plays to extend their lead. Todd completed four straight passes at one point, the first to Walker for 21 yards, and he finished off the drive with a throw to Gaines in the middle of the end zone for a 14-yard touchdown. Leahy converted and New York had a 27-14 halftime margin. The third quarter started with turnovers as Todd fumbled the ball away while attempting to pass, Casper coughed up the football after making a catch, and Colzie intercepted a throw from Todd. The last gave the Raiders the ball at their own five yard line, and unable to move on offense, they punted and the Jets had good starting field position at the Oakland 43. Two carries by HB Kevin Long and a screen pass to Gaines advanced the ball to the 20, but the drive stalled and Leahy was wide on a 32-yard field goal attempt. In a series that extended into the fourth quarter, the Raiders drove 80 yards in 11 plays. 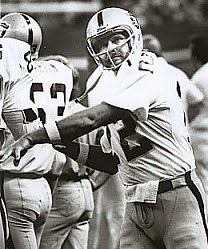 Stabler completed five passes, including one to Casper that gained 18 yards in a second-and-11 situation, and the drive was capped by a throw to WR Fred Biletnikoff for a seven-yard touchdown. Mann added the extra point and New York’s lead was cut to six. The Jets had to punt after a short series but retained possession due to a penalty on the Raiders. Todd threw to Caster for a 58-yard gain to the Oakland 10, but the Raiders held and Leahy missed another field goal try, this time from 26 yards. 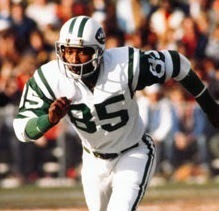 On the ensuing series, Stabler threw to WR Mike Siani for gains of 29 and eight yards to reach the New York 43, and following a short carry by van Eeghen, “The Snake” connected with Casper for 15 yards. Two more runs by van Eeghen picked up eight yards before Stabler found Siani in the left corner of the end zone for a 24-yard TD. Mann’s conversion put the Raiders in front by a point. Pinned deep in their territory following the kickoff, the Jets couldn’t get beyond their 14 and had to punt. Oakland took possession at the New York 44 with 6:11 left and never relinquished it. van Eeghen and HB Clarence Davis chipped away and reached the 11, from where Mann attempted a 27-yard field goal that missed to the right. However, the Jets were penalized for running into the kicker and that clinched it. The Raiders won by a final score of 28-27. The game was reminiscent of the old shootouts so common when the teams were in the AFL. The Jets had the edge in total yards (442 to 423), although Oakland was more balanced with 213 net passing yards and 210 on the ground, while the Raiders had the lead in first downs (29 to 17). New York turned the ball over three times, to two by Oakland, but ultimately the game came down to Pat Leahy’s missed extra point and two errant field goals. Mark van Eeghen (pictured at right) had a big rushing performance, gaining 143 yards on 36 carries that included a touchdown. Ken Stabler completed 19 of 26 passes for 230 yards and three touchdowns, two of them in the fourth quarter, and gave up one interception. Dave Casper had 7 catches for 92 yards and a TD and Mike Siani contributed 86 yards on his five receptions that also included a score. For the Jets, Richard Todd had a big performance as he hit on 17 of 29 throws for 396 yards and four touchdowns while being picked off twice. Wesley Walker caught four of those passes for 178 yards and a TD, Jerome Barkum added another 94 yards on four receptions that included a score, and Rich Caster pulled in three catches for 82 yards and another TD. Clark Gaines had 5 pass receptions for 38 yards and a TD and also led the club with 9 carries for 35 yards on the ground. The Raiders went on to win their next three games on the way to an 11-3 record, although for the first time in six years they failed to finish first in the AFC West. They were second to the Broncos, but qualified for the playoffs as a Wild Card and reached the conference title game before falling to Denver. New York continued to struggle and won only one more contest the rest of the way to end up fourth in the AFC East at 3-11. Ken Stabler passed for 2176 yards and his 20 touchdowns ranked second in the NFL, although he also gave up 20 interceptions. He was chosen to the Pro Bowl for the fourth time. 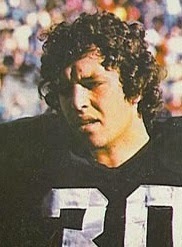 Mark van Eeghen led the AFC with a career-high 1273 yards on 324 carries (3.9 avg.). Richard Todd (pictured at left), who missed three games due to injury, had a respectable season with 1863 passing yards and 11 touchdowns while being intercepted 17 times. Wesley Walker had 35 catches for 740 yards and three TDs, and his 21.1 yards per reception led the NFL.